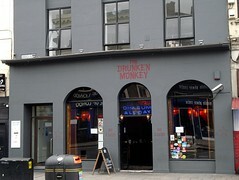 Drunken Monkey was a bar in Shoreditch. It has now closed. As of August 2018 the premises are under renovation to reopen as the Goose Island Brewpub photo of notice. Bar in Shoreditch, on the corner of Shoreditch High Street and Great Eastern Street. Serves dim sum all day. Kake and bob visited on a Monday evening in November 2007; we hadn't booked, but this wasn't a problem as the place was almost empty when we arrived around 7pm (it did fill up a bit later on). The lighting was very dim, but I guess that's pretty standard for a bar. It's table service; we had one very friendly waitress and one very disengaged/distracted one, who roughly alternated during the evening. Unfortunately the dim sum were mostly fairly disappointing. Pork and radish dumplings (£3.80 for three) were among the best of our selection; good radish flavour. Chilli salt fried squid (£4.20) was also good; it arrived hot and crisp, and the squid wasn't overcooked. The Peking potstickers (£3.80 for four) and Vietnamese spring rolls (£3 for two) were edible, but only worth mentioning because of the generally low standard of everything else. At the other end of the scale, the king prawn dumplings (£3.80 for four) were not good; for a start, they were obviously made in a press — an old Independent review says that in 2004 they were made properly, with nine pleats, but unfortunately in 2007 they have zero pleats. Also, the filling didn't hold together properly. Peking baked chicken wings (£3.80 for four) were like KFC ("but less interesting", added bob). Kake's verdict: Probably wouldn't come back here on purpose, given that there are plenty of places in London to get good dim sum. If you're in the area and looking for good food, you're probably best off walking up the road a bit to one of the Vietnamese places on Kingsland Road. On the other hand, it works reasonably well as a bar, and the "small plates" nature of dim sum makes it an excellent accompaniment to drinks. Last visited by Kake and bob, November 2007. Last edited 2018-09-22 15:38:32 (version 12; diff). List all versions. Page last edited 2018-09-22 15:38:32 (version 12).